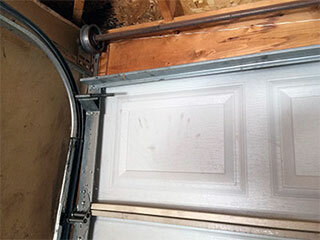 No matter how good they are, garage doors will likely give you some hassles and problems at some point. There is no one to blame for this, it’s a hard truth that nothing lasts forever, and there are so many components in a system that can break down with little warning, rendering it inoperable. So if your garage is operating like it should, then enjoy it while it does because at some point it’s going to get far more difficult (hopefully not when you’re in a rush). So to prepare yourself for the inevitable, here are some of the most common reasons your door will malfunction. The door itself is heavy and puts a lot of strain on every part of the system even when it is not in operation. The key to a well-functioning door is balance. This balance is maintained by two springs which work together to evenly distribute the door’s weight. At some point it is inevitable that this balance will step out of line, and this is usually a sign that one or both of the springs need replacing. We must point out, however that replacing a spring by yourself is not a very wise option. It is a dangerous task which is best left to experienced professionals. You should expect that a fully functioning door will have a smooth opening and closing action, but over time this can be undermined by parts that grind together to cause friction during operation. Normally you can tell that you are in need of some lubrication maintenance when you can hear the door is struggling, or it requires more physical effort than you are used to when you use it. Accidents can also be a reason for certain type of breakdowns, but usually only affect the door itself. Luckily this is relatively easy to have fixed. The garage door slats work together to open without any obstructions and so if just one slat is damaged, dented or broken, you don’t need to replace the entire door, just the slat itself. Much of what gives the door its easy operation is the fact that it operates on a garage door track which assists its movements. You can expect that at some point it will come off however, as the parts within wear down and stop holding the door as snuggly as when it was first fitted. With these in mind you should have fewer surprises when it comes to various issues with your garage doors. But there is nothing to stress about. Just about every part is easy enough to replace if you enlist in the help of a professional service-man.